WIGAN, United Kingdom, Feb 27, 2011 (AFP) - Wayne Rooney was accused of elbowing Wigan midfielder James McCarthy after Manchester United went four points clear at the top of the Premier League with a 4-0 win at the DW Stadium. Angry Wigan manager Roberto Martinez insisted United's England striker should have been sent off after the first half incident on Saturday. The game was goalless when Rooney clashed with McCarthy, but United eventually ran out easy winners with Rooney scoring the killer third goal. Rooney caught McCarthy in the face with his elbow during the opening minutes, but referee Mark Clattenburg took no action apart from awarding the hosts a free-kick. Martinez felt Rooney's elbow was part of a plan by United to intimidate McCarthy. 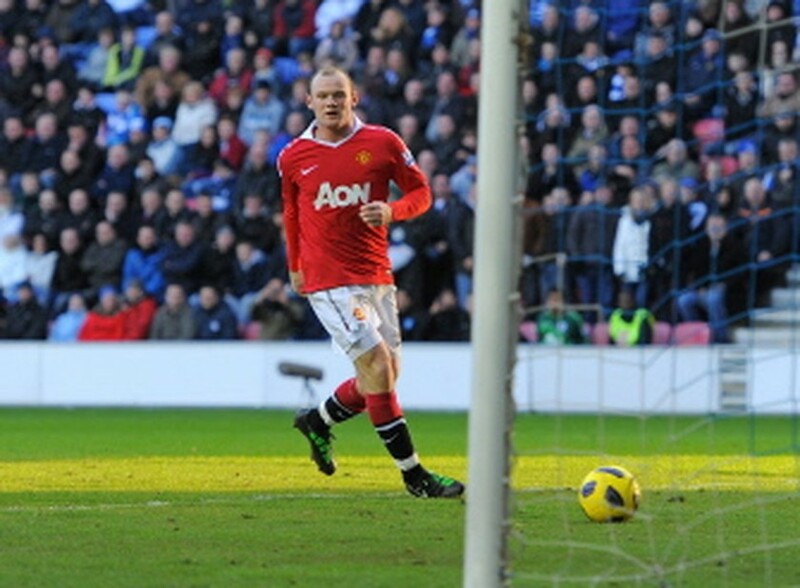 "I felt Wayne Rooney was very fortunate. It was clearly a red card," Martinez said. "I saw the incident clearly and the referee did as well because he gave the free-kick. "Once you give a free-kick it is quite clear that it is a red card. When you look at the replay, it is quite clear he catches James McCarthy in the face with his elbow. "Manchester United were trying to impose themselves on James McCarthy and stop him from playing. "If one of my players had done that, I would think he was very lucky to stay on the pitch. "It is a big call in the game. It is unfortunate because the referee saw it but he didn't feel it was a red card." However, United manager Sir Alex Ferguson felt Clattenburg was right not to punish Rooney. "I have had a chance to see it. There is nothing in it," Ferguson said. "Mark Clattenburg saw it. I think he said it was an accident. "But, what will happen, the question has been asked and because it is Wayne Rooney the press will raise a campaign to get him hung by Tuesday or electrocuted or something like that. "It is unbelievable. Watch the press. It will be interesting to see it." Despite the controversy, United travel to reigning champions Chelsea on Tuesday knowing that victory at Stamford Bridge will leave them seven points clear of Arsenal at the top of the table. They overcame a laboured first half performance to win comfortably thanks to two goals from Javier Hernandez, one from Rooney and Fabio Da Silva's late effort. But veteran keeper Edwin van der Sar still had to produce a vintage display to deny Wigan's Victor Moses, Ben Watson and Maynor Figueroa. "In the first 20 minutes it was all Wigan, they had some great attempts," Ferguson added. "Chicarito (Javier Hernandez) is great in the penalty box, though, and in the second half I thought we were excellent. "We're very pleased with that performance, although we had to hang on a bit at times. Getting the first goal settled us down a bit." Relegation-threatend Wigan are one point adrift of safety but have played more games than some of their struggling rivals. They have 10 games to save themselves but with Manchester City, Tottenham and Chelsea still to come, Martinez knows it will require something special to get clear of trouble. "The way it is going this season we cannot expect any favours and we are going to have to work hard to climb out of the bottom three," Martinez added. "It's clear the points tally to avoid relegation is going to be higher this season."